Arguably the Finest Hair Extensions at Affordable Prices. Over 15 years experience working with Hair Extensions. 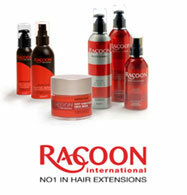 Racoon Educators / Trainers within our Salons. Racoon Hair Extensions are 100% Human Hair. CG Hair provides Racoon extensions training to other salons in the U.K. & Europe. Call 01202 520055 for a FREE Consultation with no obligation. Racoon Hair Extensions Video: "http://www.youtube.com/v/RstGXjBi2tw&rel"
Why not Xtend your looks and style with added hair length, colour and thickness from as little as £50 with Racoon Hair Extensions. With over 15 years experience working with Racoon Hair Extensions in Bournemouth, CG Hair are the “No1 in the South” within this field. We provide training to other established Hair Salons nationally and internationally. We use only the finest quality Euro hair and offer a full aftercare maintenance and rotation service. So why have hair extensions? ü To add low lights. ü To thicken up natural hair. ü To add soft waves. ü A Free Consultation will ensure that hair extensions are appropriate for you. ü We use only the finest quality Euro hair. ü Racoon Hair extensions will not damage your hair. ü We provide a full aftercare maintenance and rotation service. At CG Hair & Wigsco we provide a quotation after a Free consultation and the following factors are taken into account before a price can be given. ü Length. Price increases every two inches. ü Weight. Amount of hair required to achieve maximum effect. ü Colour blonde. A rare commodity, is more expensive than dark hair. The Racoon Hair Extensions System provides arguably the finest hair extension service in the world and has become the undisputed market leader in the UK. Racoon has teamed up with product development experts to formulate a range that meets the special needs of extended hair services. By balancing gentle cleansing and moisturising agents with natural plant extracts, Racoon have produced tailored treatments for every stage of the hair extensions process including home styling. The Racoon “Xtend” range has excellent products for all your aftercare needs.